Vermont Coffee Company publicly announced becoming the nation’s first 100% renewable biogas-powered coffee roastery in May 2018 — but this change has been a long time coming! Since founding Vermont Coffee Company in 2000, Paul Ralston has been searching for renewable energy sources for roasting coffee, which traditionally consumes high volumes of energy during the roasting process. Marketing Partners helped Paul and the VCC team get out the word about the big news through a multi-media news announcement and landing page that was picked up by numerous regional, local and major trade publications. Marketing Partners first worked with Paul Ralston in 1992 at Autumn Harp, and then again when he was with Body Shop International and subsequent independent ventures. We are delighted to welcome back Paul with the VCC team to our client family. Vermont Coffee Company is a small-town roaster located in Middlebury, Vermont. The big flavor and complex character of its certified-organic coffees are highlights of a unique style of slow-roasting beans in small batches—a process that founder Paul Ralston has perfected since the company began roasting commercially in 2000. 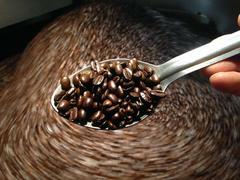 Its organic coffee is sold in chain grocery stores, local markets and food co-ops throughout the Northeast. Products are also sold nationally via the company’s online store.